This confectionary white balsamic condimento is aged for up to 12 years in Modena, Italy. 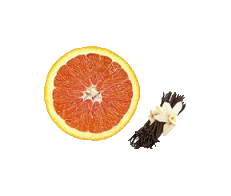 Creamy, sultry, pure Madagascar Vanilla and the bright citrus of Cara Cara Oranges combine to delight the senses. Pair with fine chocolate, drizzle over fruit salad, in sparkling water, mixed drinks, or over yogurt and vanilla ice cream. It pairs well with the fruity notes typically found in Ultra Premium Koroneiki Extra Virgin Olive Oil, and is also excellent blended with the Organic, All Natural Butter Olive Oil. Use this complex heart healthy combination over oatmeal, cooked whole grain cereal, pancakes, or in salads.